Spencer proposed on a short break away to Sardinia on my 30th birthday, we set a wedding date that would be almost 2 years to the day, May 19th 2018. Little did we know at the time that it was to become one of the most anticipated dates of the year.. the wedding of Prince Harry to his bride Meghan Markle. Spencer and I have very similar tastes which made planning together a lot of fun. We both wanted the day to be simple, elegant and classic, with not too much fuss. We went for a white and gold scheme, with the only splash of colour coming from the beautiful foliage arrangements by the florist. 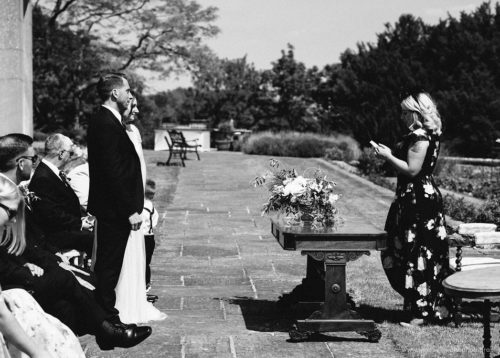 We had an outdoor civil ceremony on the stone terrace of Burton Court on what was one of the most glorious days of the year, it couldn’t have been more perfect. My advice to any bride, particularly those who are planning their own big day, is do not bite off more than you can chew! 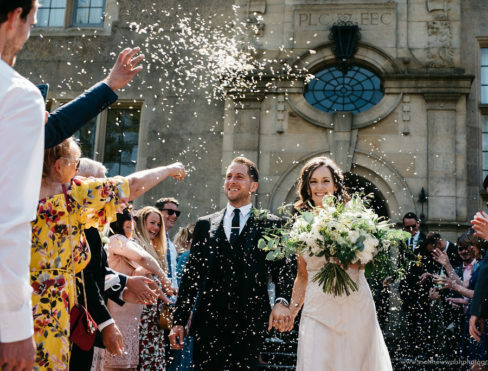 It might sound a bit obvious but there’s a real temptation to try and recreate all the wonderful things you’ve seen at other weddings you’ve attended, or on the internet, and the whole thing can become a chore. I come from a background of art and textiles but I very early on decided I didn’t want too much of the ‘handmade’ in the day. 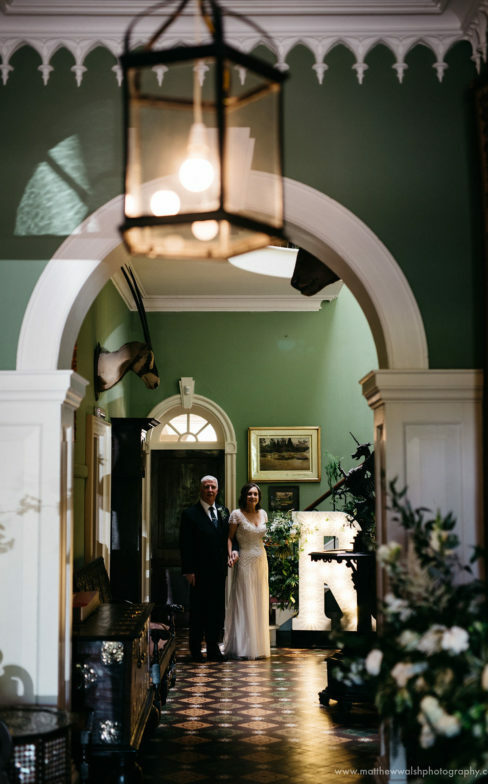 I focused my efforts on creating a huge mirrored seating plan and welcome signage for the entrance hall and that was all. It allowed us to really concentrate on geting the fundamentals, such as music, food and drink, and flowers; just right. 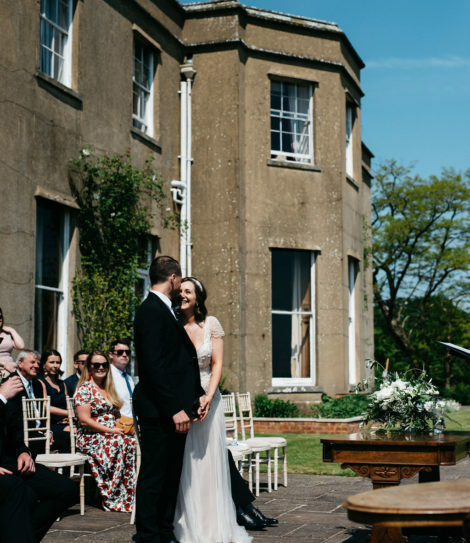 And with a setting as beautiful and characterful as Burton Court, we didn’t need much else to make our perfect day perfect for us. Spencer's real wish was to be married outdoors. One of the major draws of Burton Court for us a couple was the amazing views of the parkland from the upper terrace. 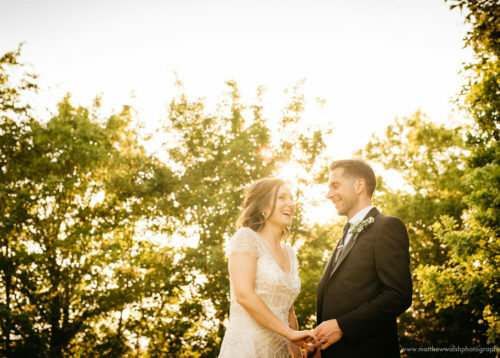 Edward told us that we would be the first to be wed outside on the terrace so we were determined that the weather would be on our side, and our vision would be a reality. We were blessed with one of the most glorious days of the year and it was everything we could possibly have hoped for. Like most soon-to-be bride's I had many a Pinterest board dedicated to all things wedding, and one particular dress featured several times. 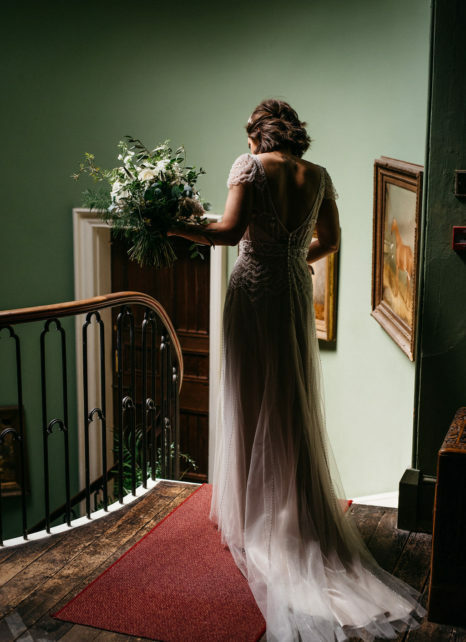 During a visit to the NEC wedding show in the early days of our engagement I'd decided not to look for my dress until I was further into the planning, but passing by a stall by Wedding Belles of Four Oaks, I saw a peek of a dress and wondered if it was THE dress I'd been swooning over... It was, and so I had to try it on. I fell in love with it and after I cried tears of sadness when I was told it might be discontinued by the time I planned to be looking, I knew it had to be that dress. 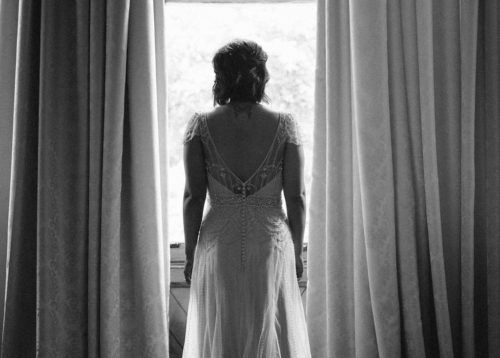 The dress was a beaded vintage style by Maggie Sottero, called Ettia. 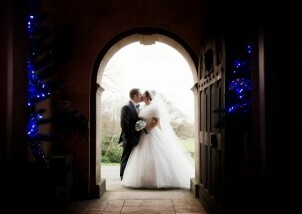 It set the feel for the whole day from then on, a relaxed elegant vibe was what we set out to achieve. From very early on I knew that I only wanted our daughter to be flowergirl and our nephew as pageboy. 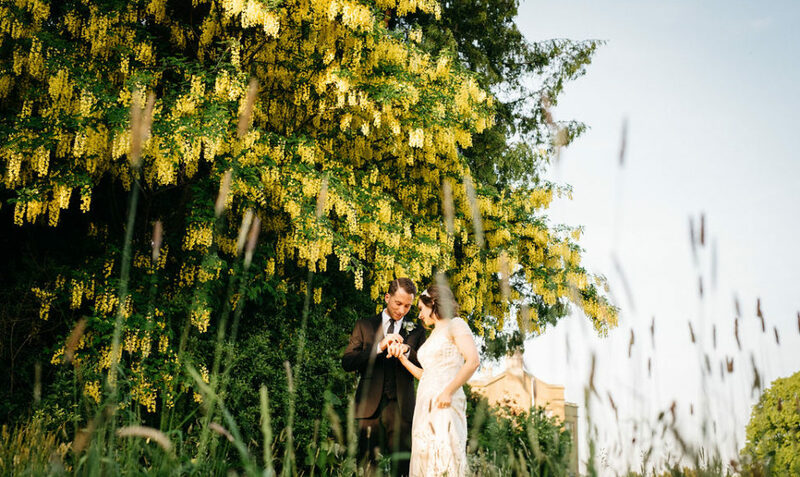 A small wedding party made decision making very easy, I bought a beautiful beaded vintage style dress for our daughter, like a minature version of mine, from Monsoon. Our nephew co-ordinated with Spencer and the best men, and wore black trousers, a white shirt and a black dickie bow tie. 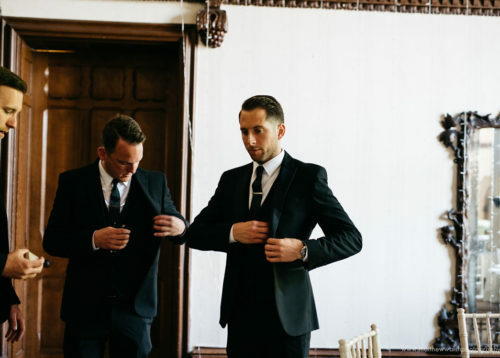 Spencer was always adamant that on his wedding day he wanted a sharp, classic look, so he chose a black 3 piece suit in a contemporary fit, as did the two Best Men. 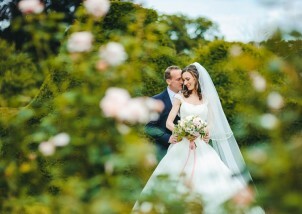 They all bought their suits from the high street and had button holes to match the bridal bouquet made by Issy & Bella. 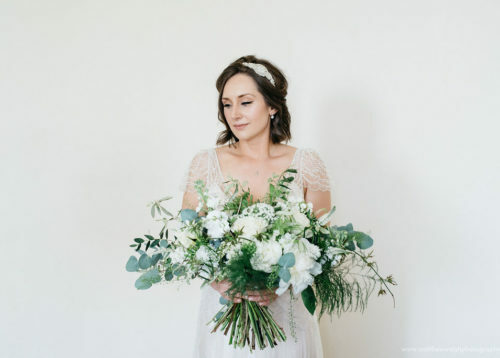 I'd admired Issy & Bella's beautiful work at a few wedding shows I'd visited but it wasn't until a mutual friend told me how close she was located to Burton Court that I knew it was meant to be! Jo knew exactly what I was looking for, we shared Pinterest boards so she could really get a feel for the look I wanted. Her work was outstanding, a real highlight of the day. When we arrived in the morning she was already there with her team transforming the space, and as she over-estimated the amount of flowers needed for the overmantle in the Great Hall, she constructed the most wonderful pieces for the large planters outside the main doors. She exceeded all our expectations and more! 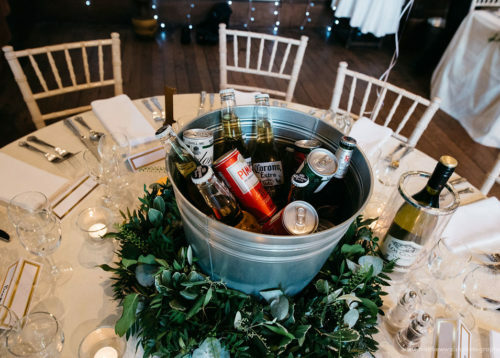 To carry on the relaxed feel of the day, with all our friends and family in high spirits, Spencer wanted 'Brits' style ice buckets filled with bespoke drinks for each table. We worked with Edward's advice to offer a selection of beers, ciders and pre-mixed cocktails, and put them in galvanised buckets sat within wreaths of foliage made by Issy & Bella. We managed to incorporate them perfectly within the scheme of the room and they were a great point of conversation amongst our guests. 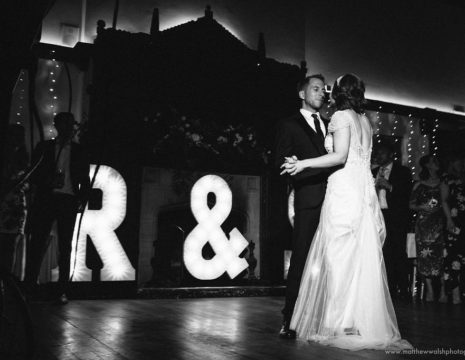 We also hired large marquee initials from Aisle Hire It to stand in the foyer, under the stairs. 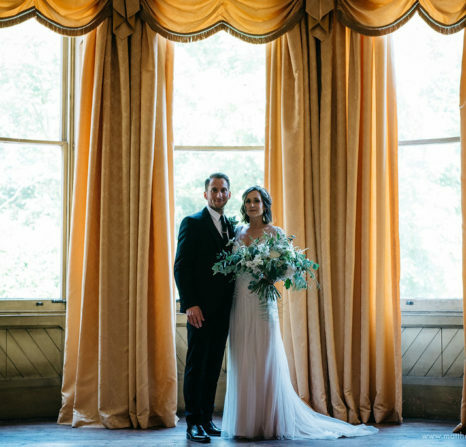 They made the ideal backdrop for photos and when lit up and moved into the Great Hall for the evening reception, they certainly had the wow factor! 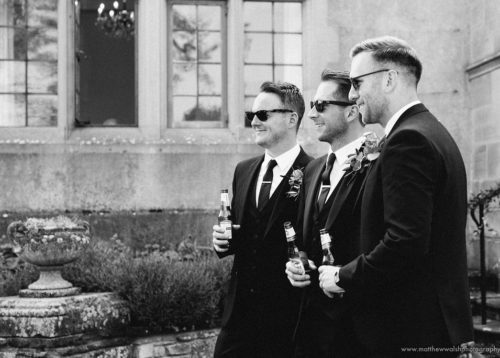 As we were hoping for a lovely sunny wedding our aim was to have post-ceremony drinks served on the terrace with a relaxed feel, so we provided bottled beers for the gentlemen and prosecco for the ladies. Our favourite drinks for our favourite people! Edward was an amazing help, sourcing the drinks on our behalf using quality suppliers, to relieve us of some of the pressures that came with planning our wedding ourselves. 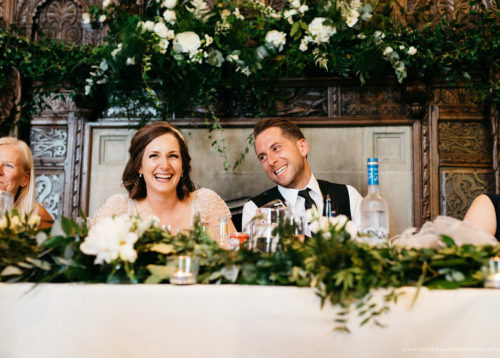 The bar at Burton Court was a real draw for us, it has a real country pub vibe amongst the elegance of the house itself, and we could immediately imagine it as a haven for those who wanted to eat, drink and celebrate away from the music during the evening reception. 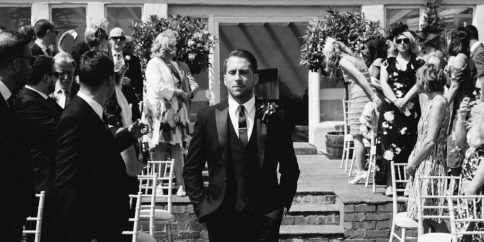 A2Zest were recommended to us by Edward and after our first meeting with Jan we knew we didn't want anyone else to cater for our big day! She was passionate about all our ideas and the advice she gave us to help make our plans work was spot on. 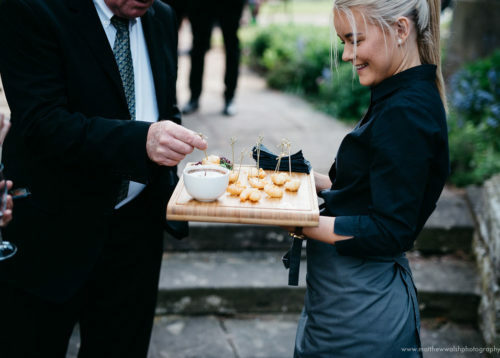 Although we knew we wanted a sit down meal we also wanted a relaxed feel to the day so we opted for canapes to be served in the sunshine alongside the reception drinks, in the place of a starter course. We really wanted to offer our guests a choice of main to add a bespoke feel to the day so we offered a chicken nicoise and a light pulled beef shin for guests to choose, and a summery eton mess for dessert. Our wedding cake was made by a wonderfully talented mum of one of my dearest friends. We decided to eschew the traditional fruit cake and went for a very summery lemon sponge, and a crowd pleasing victoria sponge to keep with the simple and relaxed feel of the day. 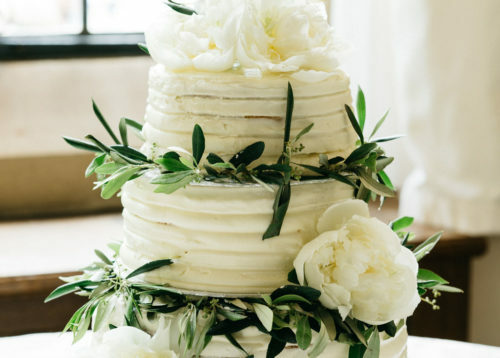 I requested that it have a simple buttercream frosting and had arrangements made by our florist Issy & Bella to be added to on the day, carrying on the flowers and foliage from my bouquet, and I sourced the gold topper from eBay. Finding a venue was proving to be one of our toughest decisions, we were struggling to find somewhere that wouldn't feel too grand for what we thought was a relatively small ceremony and reception but everywhere we viewed just wasn't big enough that it wouldn't seem an uncomfortable squeeze. 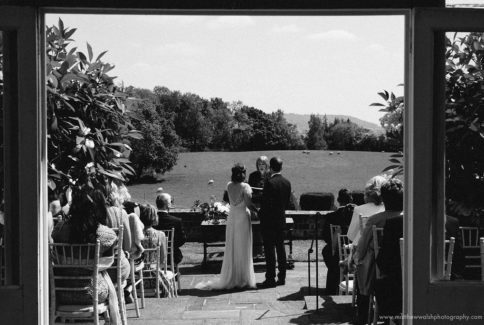 We'd passed by Burton Court on trips to where Spencer's parents live in Presteigne so we were familiar with it as a wedding venue, and after viewing the updated website and seeing the transformation Burton Court had gone through over recent years we knew we had to visit. 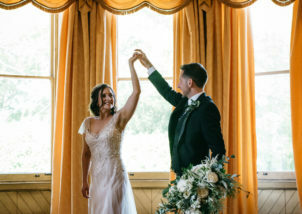 Edward and Helen were the most welcome hosts, they really understood the wedding we envisaged and Edward was nothing short of brilliant with his contacts, knowledge and enthusiasm to help us pull of our perfect day. 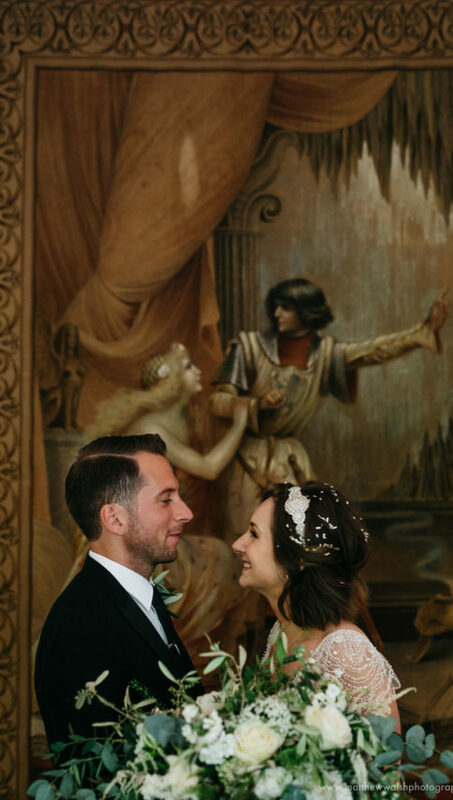 Choosing to marry outside on the terrace, we decided to set our reception in the Great Hall. The mantlepiece made the most perfect backdrop for the top table, we had it adorned with foliage and it was a real focal point of the day. The flow of the house works so well, we used one of the rooms for cake and coffee to be served so it would be quieter, more restful space for guests. I came across Matthew Walsh Photography through a friend on Instagram who'd modelled for a shoot that he photographed. 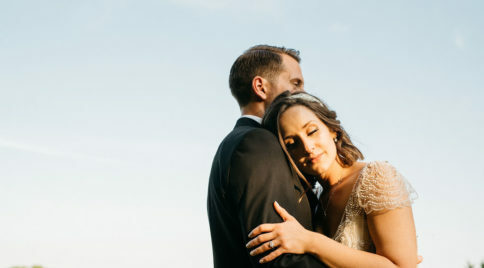 We were instantly drawn to the style of his photography and upon meeting with him knew he'd capture the day exactly how we wanted. He had very similar views to us and acknowledged my insecurity about being photographed which was very reassuring. We had a pre-wedding shoot in local woods which featured our 3 year old daughter, so she could get to know him before the day, and so we also now have a fantastic set of family shots to treasure. We really wanted a memorable evening reception, so we asked ourselves what would be our ideal reception if we were attending as a guest? The answer was simple, good food, good drinks and even better music. Burton Court had the drinks side of things down perfectly, so we could focus on food and music. A2Zest were really on board with our idea of wanting something really informal to contrast with the sit-down wedding breakfast. They supplied delicious homemade pizzas, served to guests by hand to put an elegant spin on things. 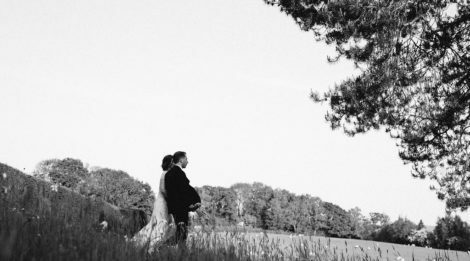 We couldn't have asked for anything more perfect for our already perfect day. For music, we both wanted something lively, and that would keep everyone dancing the whole night long. 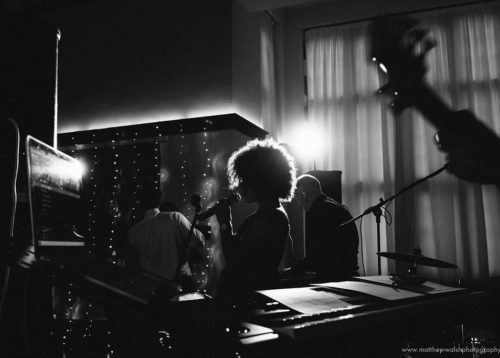 We both have a shared love of R'n'B music and an appreciation for motown and soul from our parents, so when we stumbled across 'The Manytones', the search was over. 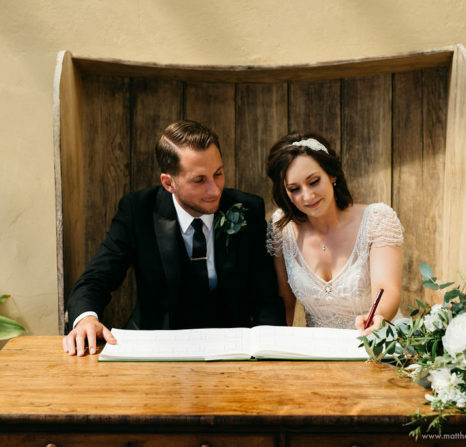 They travelled all the way from Widnes, sent us their proposed set list shortly before the wedding, and asked us to compile a playlist of all our favourite music to help them lay on the perfect DJ set. The icing on the cake was them performing our first dance live, an Alicia Keys track, which was a completely tear-jerking surprise as we not even had the chance to hear it beforehand.